This Asian Chopped Salad is ready in 10 minutes, is packed with nutritious vegetables and is full of flavor with a sweet soy vinaigrette! When the weather gets warmer, to me, that means leaving my stove and oven off and either firing up the grill or making a huge salad. I recently went to a local Michigan blogger dinner with friends (some of who contribute to this site) and had an amazing chopped salad that I wanted to recreate at home. Of course, I made many changes and made it my own. 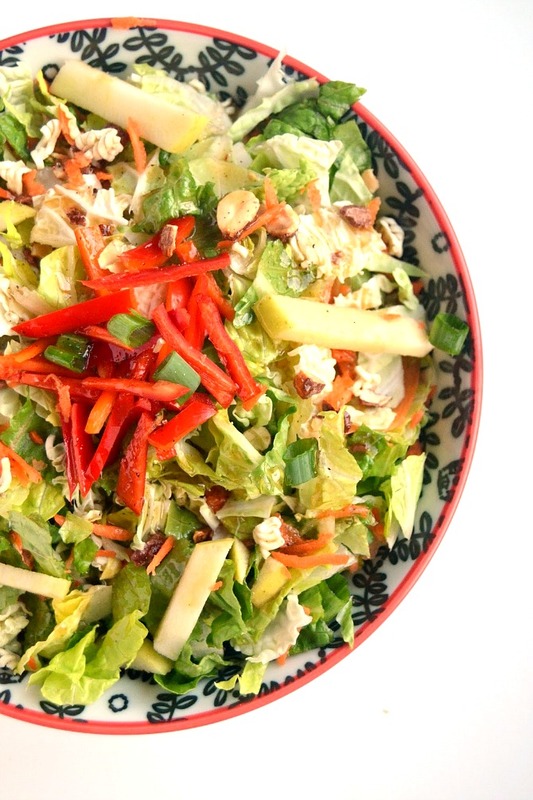 This Asian chopped salad turned out awesome and served well as leftovers for a couple of days. The dressing is a sweet soy vinaigrette that I tossed together and was happy with the sweet and sour flavor. I tossed in some Michigan golden delicious apples for crunch and sweetness which provides fiber and vitamins A and C. Curly cabbage provides more crunchiness along with 79% of your daily vitamin K for one serving. Bell peppers contain over 150% of your daily vitamin C and are sweet and flavorful. Carrots are rich in vitamin A in the form of beta-carotene. To make the salad more filling, I added chopped almonds which are rich in fiber and protein as well as healthy fats. The ramen noodles are for crunch! This salad can be thrown together in no time and can be made the day ahead. It would be perfect for a summer get-together. I served this to my mom and husband and they both enjoyed it. 1. Combine ingredients for chopped salad and mix well. 2. Whisk together all ingredients for vinaigrette. 3. Toss salad with vinaigrette and serve! Disclosure: This post is sponsored by Michigan Apples. All opinions are my own.